The shock of a murder threatens to distract a small Indiana town from its annual festival. 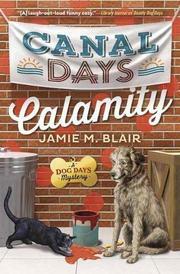 As they prepare for the grand opening of Dog Diggity, a specialized treat shop for canine companions, Cameron Cripps-Hayman and her sister, Monica, have their hands full with Mrs. Nelson, their mischievous landlord. The older woman had agreed to rent the store space at a discount as long as she could be involved in the shop’s goings-on, and Cam and Monica are happy to have the help, but it comes at a price. While the three are repainting the storefront, Mrs. Nelson ducks round a corner of the store and discovers the body of one of their Metamora neighbors. Local police in the form of Ben, Cam’s estranged-but-working-on-it husband, identify the murder victim as Butch Landow, someone not known to have significant enemies in the friendly town. Ben is concerned lest Cam once again involve herself in a murder investigation, as she did with the Metamora Action Agency (Deadly Dog Days, 2016). Cam can only wish she had the distraction of investigating when Irene, Ben’s mother, finally invites her to join the Historical Daughters of Metamora. Maybe this is the family acceptance Cam’s been craving, but she’s still not sure she’s the right fit for the group; she’d rather spend time at home with Mia, her teenage stepdaughter. The question of Cam’s investment in the group takes a back seat to her renewed interest in the case when her handyman, Andy, is brought in as the prime suspect. As the mayhem of the town’s annual Canal Days festival rapidly approaches, Cam resolves to get to the truth and free a man she’s certain has done no wrong. Blair’s cozy with an identity crisis dabbles in mystery while covering romance, family dynamics, and a love of dogs—all of which leaves little room for the whodunit.